Contemporary times are tough times. It's a time where everyone's is in hurry, in a race so to speak, where the most common thought process is - "I'm not satisfied in life until and unless I'm not ahead of every plausible competition I can imagine of". In times like these, finding a humble wisdom is tough, finding a humble wisdom on a saddle is tougher, but finding a humble wisdom on the saddle of a Super Sports is rare. ThrottleQuest : At the time you bought your R1, the bike was not officially available in India. Which makes me think that you could have bought any bike in the same price range and with the same specs - you could have bout the ZX10R or GSXR1000. So, why the R1. What was so special about the bike that caught you? Ken Da : I had tried the 1000RR, the 10R, the Gixxer. I had not tried the R1. That was the biggest factor on deciding on the R1. Besides the One looked the Best of the lot then, back in 2007. ThrottleQuest : What sort of planning (I mean logistics, finances, facilitation) were required to finally see the black beast in your garage? ThrottleQuest : Buying a Super Sports Bike is the easiest part in the complete life cycle of a person with his bike (when you consider the pressures in a society where, priorities always wins over passion). So, what sort of preparation is required to be done, before one brings 1000 or more horses home? Ken Da : You see... in my life, ever since I have led an adult life, ever since I have turned 18, I have had no family or any such pressures. I mean they have probably been there, but I totally ignored them. I REALLY do not care if anybody says anything to me. If I want to do something and if I have the means to do it, I WILL go and do it, no matter what other "family pressures" or "social pressures" go with it. Just to give an example; I went in to a live-in relationship from the time I was 22 with a girl who had just turned major at 18, and this happened 20 years ago! I really did not give a damn of what the society or family thought about me and I still do not. So you see, going and buying a 1000CC motorcycle if I have the finances is not really "big" step for me. Hence it does not require much "preparation" to "cope" with pressures. That does not mean that I ignore my responsibilities. This has to be taken in the context that I am speaking. Ever since my Mom's health start deteriorating, I brought her over from her home in Calcutta and she lives with me which is a BIG deterrent in my lifestyle. But I do care of her and her holiday and other needs, funding part of her expenses and all of her expenses of sending her abroad for travelling and holidaying. But she is NOBODY to dictate what I do with my life or what motorcycle I buy or ride. I see myself as a responsible adult and try to behave accordingly. ThrottleQuest : What kind of riding habit you needed to cultivate within your self in order to ride the R1 the way you ride. I thing I noticed yesterday that you were hanging off the bike. So, did you practice that specifically for the R1? How well do you think the riding techniques applicable to a motorcycle of the genre of the R1 is applicable to other Indian bikes, say my Pulsar 200? Ken Da : The R1 and the P200 or the P220 (with clip-ons or straight low bars, not the high re-inforced bars of an off-road bike) or the Hunk or the R15 or the Zma can be ridden with similar riding techniques most of the time. Riding geometry is quite different (barring the R15) in most of these bikes. But, I ride them almost exactly the way I ride my R1. Have you seen my photos of the way I "hang" out even from the P200? I touched down the knee even with that and the Hunk too. So as long as it is a motorcycle of the kinds I described above, I am comfortable on it. Though amongst the list above, the R15 is the easiest to ride without doubt. Ken Da : Difference between my P220 and my R1: I really do not care. They are just motorcycles. I enjoy both. I do not feel much difference on the streets. But I guess, once I am on track, I would prefer to use my R1 rather my 220. ThrottleQuest : How daunting do you find the task of taking time out for your bike from amongst your busy schedule (I mean from within your professional and personal life)? Ken Da : I do not find the task daunting at all. I make sure that my life is such that I get to do whatever I wanna do (finances permitting); be it riding a motorcycle, going for a good movie, listening to music, spending time with a beautiful girl in mini skirts, travelling, working on my photography and so on... this is what life is all about... trying to live it the way you want. It is YOUR life after all. ThrottleQuest : Is you bike stock or there been some mods done on it and if there are mods then what are they and what kind of benefits/boosts they have provided? K and N Filter. Saves me the hassle and expense of changing air filter every 5K kms! Double Sport Touring Bubble. Essential for ANY superbike if you wanna hit high speeds which really shakes your head on the stock bubble of most Sbks with the possible exception of Ducatis. Sportbikecam.com support on the tank for mounting a camera. Very good attachment! ThrottleQuest : Taking my example here, what kind of thought process goes through your mind when somebody asks you permission to review your bike, or to ride your bike? Long story short, what made you agree so readily to my request? Ken Da : You are an avid biker. Which means you know how to ride a motorcycle. And you are about to become a father, which means you know how to handle a LOT of responsibility. That is good enough for me. There are a lot of people who ride a motorcycle. But most of them do not even know how to take responsibility for their own selves let alone for others. I would not trust them even with my tricycle! 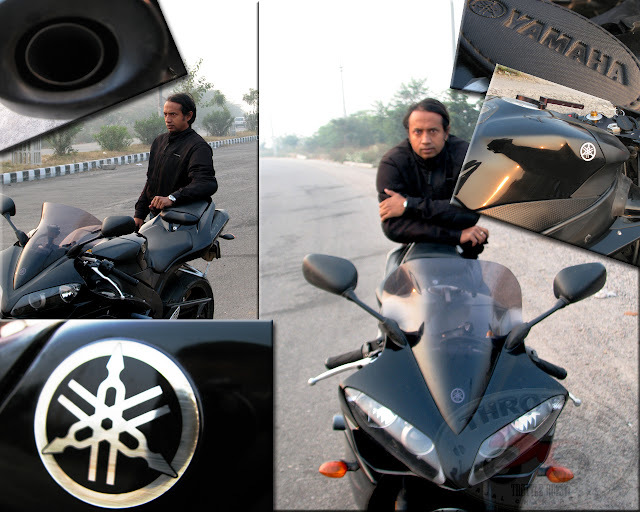 ThrottleQuest : For me a Super Sports Bike is more than a bike, it's a learning institution to me. So, what has your R1 taught you in all these years of ownership? Ken Da : Totally agree... the Sbk ownership has taught me more responsibility, control on the right wrist, focus and concentration. And if you really want to enjoy your ride, go to a country which has better roads than here and where a biker is not treated as a second class citizen. ThrottleQuest : What suggestion would be you like to give to so many dudes out there like me how are an ardent fan of the Yamaha R1 and who are planning to get the steed home some time or the other? Ken Da : I cannot answer that question. I am not an ardent R1 fan. I am a fan of good motorcycles. There are good motorcycles out there. The R1 is a good motorcycle. But I have ridden better. But if you like the R1, go and get it! Needless to say, that the conversation with Ken Da was a major achievement in the journey of ThrottleQuest and more than that, this conversation would always remain close to my heart personally and would remain a guide to me. The the write up is on..!! Ken da has always been a man who has followed his heart. A free bird. It reflects in his bikes as well. Really man, the amount of positive energy he exudes, just with is smile is immense! !